I have great sensitivity toward politics and culture in Africa, and I have learned far more about western Africa in particular through their fabulous music than through my frequent reading. 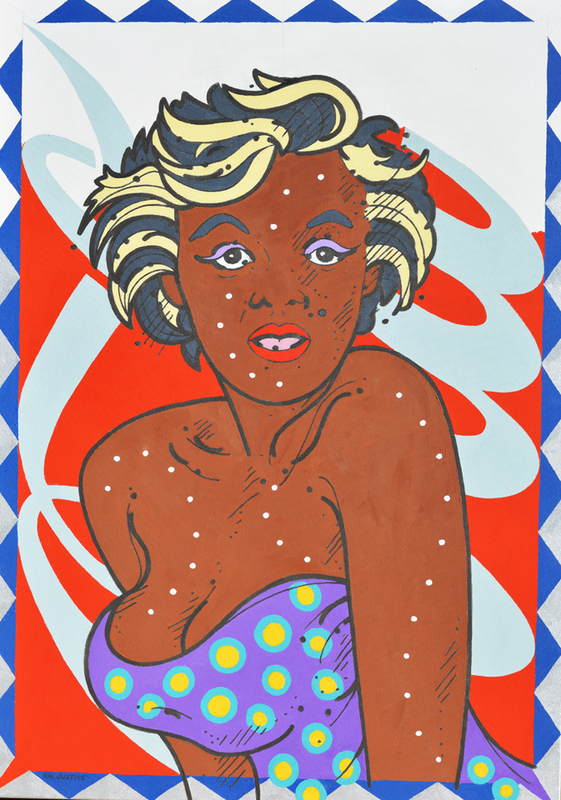 One result of this cultural collision is “Marilyn Monrovia”, an exploration of African and Western beauty standards, shown here with evidence of globalization looming (unfinished) on the wall behind. The red could also be thought to refer to China’s African agenda. Diamonds are a girl’s best friend, but the decorative metallic and diamond border also refers to mineral exploitation of Africa. Re. the title, Monrovia is the capital of Liberia.